World's Finest (Part Two): "Early Warning"
Superman and Batman are still trapped from where Metallo left them buried beneath the cemetery. Batman realizes that they are running out of air and prepares an explosive charge to help them escape. Superman is still weakened from the Kryptonite bullet and is delirious, remembering a similar incident where he and Pete Ross were buried with Kryptonite rocks and the two had to work together to escape. Batman uses Superman's body as a shield the charge blows and sends them falling deeper underground into the sewer system. Superman manages to get Batman out of the water and the two make their way through the sewer to the Batcave. They come across an electrified gate and even though the Kryptonite is still leaving him weak Superman manages to absorb the electricity and they pass through. Alfred meets them, shotgun raised and ready for trouble. Batman announces their presence and Alfred helps his employer with Superman. Meanwhile Captain Atom and President Luthor watch the progress of three missiles as they near the Kryptonite meteor that is heading toward Earth. Atom points out that the Boom Tube used to deliver the missiles is illegal and represents trade with an embargoed planet. Luthor cautions Atom not to take that tone with him and asks Atom how they were supposed to get that much firepower across the solar system to save the Earth. He goes on to say that if people learned their lives were threatened that panic would spread through the streets. In the end, according to Luthor, it doesn't matter how they stop the meteor but that that the meteor was stopped. The missiles reach their prey and it fail, leaving the meteor on it's trajectory with Earth. In the Batcave Alfred succeeds in removing the Kryptonite bullet. Superman rises off the table and joins Bruce at the computer. Bruce asks Clark why he didn't tell him about Corben. Clark begins to tell him that he tried, but Bruce interrupts telling him it took Oracle less than five minutes for Oracle to hack through STAR Lab's firewall, another two to download Corben's encrypted file and less than half to break the code and tell him what he needed to know. Superman repeats that he tried to tell him and that was the reason he came to Gotham in the first place. Bruce asks how long STAR Labs has known this information. Clark replies that he is not sure that the information was entirely accurate and that the information could have been planted to stir up this kind of reaction. Bruce screams that it the information was for him to find out. As he pulls his cowl back on Bruce reminds Bruce that before John Corben became Metallo he was a petty thief. He was also in Gotham the night Bruce's parents were killed and he carried the same caliber handgun that was used in their murder. Clark asks why Corben's name hadn't come up in any of his traces. Bruce explains that betweens the corruption, fires and earthquakes that Gotham has gone through files could have been misplaced. He adds that he would like to know why STAR Labs kept this a secret from Clark. Clark repeats his suspicions of what Bruce has found. Bruce begins to ask about how Clark would feel if he found out something about Krypton when a Boom Tube rips into the cave. As Clark and Bruce regain their bearings they see what appears to be an older version of Clark. The future Superman says that it worked and that means he still has time to kill them both. He unleashes his heat vision, which Clark blocks. Clark informs Batman that they need to know what they're up against and uses his x-ray vision to scan the intruder. The future Superman asks if Clark is x-raying him since that would be the first thing he would have done. Clark is shocked that not only is the intruder him down the cellular level but he also knows that Superman is Clark Kent. Batman orders Alfred upstairs as Clark and the future Superman begin to fight hand to hand. Clark silently wonders about whom this intruder is and if the Kryptonite bullet is why the future Superman seems stronger than him. The intruder, meanwhile, informs him that he is in fact him from the future. He goes on to say that he has come to stop Clark and that despite the fact that he will think he's doing the right thing he's wrong and he'll end up killing them all and being alone. From a distance Bruce watches and the future Superman tells him that he's wasting his time. Bruce tells Clark that he is in fact fighting himself and the future Superman adds that Bruce should tell him what he's really thinking and that's that he's killing himself. Clark takes to the air and says that he doesn't know who the future Superman is but it's not him. He goes on by explaining that he doesn't kill and he has never given up on his own life adding that if he wants to stop him they should take it outside. The future Superman grabs Clarks leg and as he throws him across the cave he tells him that the ridiculous moral code he keeps is going to get everyone, Lois, Jimmy, Perry, Ma, Pa, even Bruce, killed. Batman tries to get into the secure area to gain access to the Kryptonite, but the future Superman stops him. He tells Bruce that he never learns and that he knows he only wore the ring when he came to Metropolis. He tells Bruce that the one thing he got sick of was getting the crap kicked out of him with Batman's toys when he's nothing but a man who got to stay alive only because he let him. Clark gets up as the future Superman stands over Batman ready to crush him with an older version of the Batmobile. He tells Bruce that he should have killed him when he had the chance but that will never happen now since he is about to take away that choice, a choice he will ultimately fail to make. From a distance Clark takes the Kryptonite shard that Alfred had pulled from his shoulder and realizes it won't kill him, but it will stop him. Since he can't throw it hard enough by touching it he loads it into a shotgun. He calls out Clark and fires. The cry distracts Superman, who is stunned since no one has called him Clark in years. As he begins to fade away he says that the only hope is that they don't make the same mistake. He mumbles something about Bruce and Lex and to beware and is gone. The Batmobile falls, but Clark gets Batman out in time. He asks what that was all about and Batman replies by asking if it was a warning. Meanwhile, Lex prepares to address the nation. Captain Atom asks to speak to him. Luthor is annoyed, but Atom assures him of the urgency of the interruption. He makes a formal request that he go and speak with him to give him a chance to surrender. Luthor asks rhetorically is Atom thinks that this is some personal vendetta and that he wants to ruin his life before the world ends. Luthor then informs him that if he interferes in any way he will be charged with high treason and that once he is in custody the lab boys will cut into his "shiny wrapper" and open him up like a can of peas. He then orders him to be a good soldier and to get back in line. Luthor begins his address and tells the people of the world that there is an asteroid the size of Australia on a collision course with Earth. He continues by adding that the asteroid is irradiated that in the days to come they will begin to feel the effects. They will become dizzy and nauseated and that in time it will overwhelm them. He tells them that despite their best efforts they cannot even slow the asteroid down. It continues as though it had a single minded purpose; to eradicate mankind. The asteroid is not some random phenomenon, but a fragment of the planet Krypton, the birthplace of Superman. As incredible as it may seem the asteroid is coming because Superman is on Earth. Luthor informs the world that despite his past theories on the alien menace Superman posed he has come to see him as mankind's friend. Luthor adds that he is not. He is an alien, a curse upon the planet and by the power vested in him by the people of the United States he is offering one billion dollars to the individual or individuals who brig Superman to the federal authorities in Washington D.C. so he can face charges of crimes against humanity. From the Batcave Bruce asks Clark what Luthor wants. Superman replies a showdown, at last. Bruce says that they should give it to him. His eyes blazing Superman inform Bruce that he would love to. 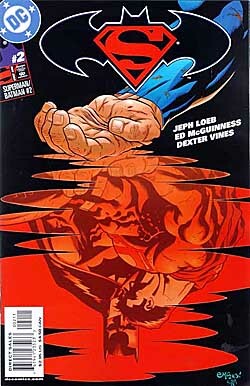 Story - 5: I remember back in 1999 when the Superman line was gearing up for its big revamp and reading a post from Jeph Loeb his plans for Superman. It was a short post and if memory serves had the line "Superman will throw down" in it. I was discouraged and thought that despite my high opinion of Superman: For All Seasons that things might not bode well for the book Loeb was taking over. I may have even made a few Commando and Teen Wolf jokes. Kind of funny when you consider the fact that Jeph Loeb is now my favorite Superman writer. Ever. I have been reading the books for sixteen years and have gone back and read many of the back issues and classic stories of the past and while I thought there were some very talented writers who brought their own unique perspectives to the character no one has ever "gotten it right" at least from my point of view (a completely biased point of view and in no way a statement intended on how things should be). As his run on Superman went on I found it was the one Superman book that I really looked forward to reading. I thought his blend of the Post and Pre-Crisis Superman, his dead on characterization of Clark Kent, Lois Lane and Ma and Pa Kent, his introductions of elements from the Christopher Reeve films and his take on Lex Luthor all made for some fantastic reading. When he left the title I was really bummed about it and wondered how things were going to go from there. Needless to say I am very happy to have him writing Superman again and in updating the World's Finest concept. My opinion of Loeb's Batman is similar to my opinion of his Superman. While I can't give him the title of Favorite Batman Writer (mostly due to the fact that I am not as much of a Batman fan as I am a Superman fan and the fact that I haven't read as much of the Dark Knight as I have of the Man of Steel) I have to say he is in the top five. Like his Superman there is a lot of thought put into the thinking process of Batman and the fact that Loeb seems to have such a definite take that you can't help but get drawn in. I have caught up on his run of Batman, so between that and The Long Halloween and Dark Victory I am familiar with Loeb's Batman, which is why I am enjoying this series as much as I am. Issue two, part two of the World's Finest story arc, had all the beats of a really good Loeb comic. Plot, character, dialogue, throw down action and a curve ball that comes out of nowhere. We'll deal with the plot first or at least the three possible plots that are now dangling before our eyes. The John Corben sub-plot is one that I am intrigued with. During and after Zero Hour, when it was decided that Joe Chill did not kill Bruce Wayne's parents and the murderer's identity unknown, I was uncertain how I really felt about it. In the end I thought it added to Batman as a character making him more obsessed to protect the innocent against faceless criminals because the man who killed his parents had no face of his own. By bringing into play the possibility that John Corben is the killer brings the two characters together and gives Corben himself a bit more character, which he has been sadly lacking. The search will be interesting and provide some good reading to the point that the outcome really doesn't matter because either way it'll be a fun ride. Plot number two, the Kingdom Come looking Superman coming in and busting up Superman, Batman and the Batcave provided a preview of what I hope is an upcoming arc. Now I don't know if it is the Kingdom Come Superman. It sure looks like him but I am not sure because it could be a red herring. The comments "Superman" made were intriguing and a good set up for a future storyline. Hopefully we won't have to wait long. Then there's plot number three. Luthor using a world-wide disaster to make a move against Superman. I liked this mostly because it shows why Luthor chose to become President in the first place. It's been about three years since Luthor was elected and it seems that the DC Universe as a whole has taken the situation for granted, especially the Superman books. Luthor didn't run because he wanted to serve the public. As cynical as it sounds most people don't enter politics for the greater good. Luthor wanted the power that being President could give and has at every opportunity used that power to his own ends. This time he has used that power to take down the man he hates the most, which may have been his plan all along. Character and dialogue are next and make up the bulk of why this was a good comic. Few writers have done anything with the relationship with Batman and Superman besides a few superficial comments here and there. Chuck Dixon dealt with it through Nightwing. Dan Jurgens made a stab at it with his story in the first Superman Secret Files and Origins by having the characters sit down over a cup of coffee. The general consensus seems that Batman respects Superman but doesn't trust him because of all the power Superman has. Superman respects Batman but almost feels sorry for how obsessed he is. Clark is not na�ve, but he is a born optimist and wants to see the best in people. Batman is a pessimist, a glass half empty type of guy who sits and wonders when the glass will be completely empty and eventually crack and break. On the surface these two would not be friends. However all relationships change and if you work with someone long enough you begin to learn the way they think and from that you understand and may even grow to like them. Loeb portrays the characters almost as if they are at a crossroads. The inner dialogue that mirrors each other bears this out, especially after the future Superman makes his appearance. Superman's take is that Batman will never let him become that and Batman's take is that the image will follow Superman for the rest of his life. That's a big departure from the past eighteen years and will be what makes or breaks this comic, but Loeb can pull it off. Then there's Luthor. Luthor hasn't been this well handled since before the whole "They Saved Luthor's Brain" stuff. Loeb's Luthor is cool, calculating and willing to do anything to accomplish his goals. The interaction with Captain Atom was interesting because most people might be intimidated, even on a small level, by the power Captain Atom wields. Not Luthor. Nothing intimidates this man and that has to unnerve those around him. This is why when Wolfman and Byrne re-invented the character into a business man it made the character more evil. Despite what that History Channel special said Luthor was not changed to be "grim and gritty" he was changed to make him more of a believable threat to Superman. As I said Luthor became President for his own ends and one of those ends is the elimination of Superman. His comments to Captain Atom at the end of the issue, the rhetorical questions he asked about making the situation into a personal vendetta and that if the world is about to be destroyed he would destroy Superman's life first were an admission, at least to my mind and now he is going to use the power of the federal government to kill his enemy. I have the feeling that when he learns of Batman's involvement that bringing down the Dark Knight will be seen as an added bonus. The throw down and the curve go back to the future Superman. One could argue that it really didn't have any place in the issue, but set ups to future stories often come out of left field, at least the best ones do. Superman vs. Superman with all of the psychological implications made for great reading. For Superman it was a glimpse of something he thought he would never become. The future Superman was a Man of Steel without hope, which must have thrown Clark for a loop. For Batman it was a validation of his fears, but at the same time it seemed like he felt bad for Clark, which was a nice change. The fight was well paced and provided the necessary action that a comic with Superman and Batman almost demands. And Superman doing a one handed pump action with the shotgun was cool beyond words. Yeah Superman doesn't use guns, but you can take the super-hero out of the farm but you can't take the farm out of the super-hero. Overall I have nothing bad to say about this comic. I really try to be objective about the comics I review, but at the risk of sounding like a complete fanboy this was a really cool comics and once again I have a book that as soon as I finish I want to read the next installment. That's a good feeling to have after becoming a rather cynical reader. And just so you know I am a complete fanboy, with Loeb's involvement with the Smallville series (nicely referenced in Clark's inner dialogue at the beginning of the issue) why is this man not working on a Superman script? Art - 5: Like Michael O'Connor, the other reviewer for this title, I used to have a problem with Ed McGuinness' art. I thought the manga-style art was ill fitting for Superman. As time went on, I really grew to like his art work, especially when coupled with Loeb's writing. When it was announced that the two were being reunited I was almost as happy having McGuinness drawing Superman as having Loeb writing him again. This issue did not disappoint. McGuinness and Vines packed a lot of detail into their backgrounds and showed some solid story telling capabilities. The sewer scenes were very well done, especially the little things, like the detail put into the brick. The use of shadow added to the mood of this scene and while I can't say that I could "smell" the environment, a lesser artist would have left a lot of things out, or used the shadows to fudge having to use detail. The scene where Atom and Luthor were watching the progress of the missiles was well paced. The four panel scene in the middle of the page after the missiles failed was a nice layout. The fight between the Supermen was paced well. The set-up was great. The face-off between Batman and Superman leading to the splash page leading directly into the fight flowed well. The second page of the battle screamed action, especially with the lack of backgrounds. This was a nice contrast to the fourth page where Superman went flying through some of Batman's trophies. The ultimate scene was "Superman" standing over Batman holding the 60's Batmobile. That was all about some cool. One of the nicer pages was Clark shooting himself. The path of the bullet, the expression on the future Superman's face, the fade effect and the red steak of Superman saving Batman all gelled together nicely. If the art continues with this quality I can't see where the series will go wrong. Cover Art - 5: On the surface a simple cover, but when you really look at it this was an eye grabbing cover. Superman's hand grabbed me at first and the pool of blood with a black background was the second thing I liked. Then I saw the reflection in the blood and I was hooked. The sad expression on Batman's face and a Superman dying in his arms sent this cover off the grab me scale. At first I didn't like the logo, but it has grown on me since the first issue. Overall a nice cover.